Honestly, this week has been crazy. I can't believe it is Friday night. I could really use one more day. I feel like everything is a blur. The boys both had concerts, extra practices, testing, parties and homework. We decorated the tree (I will post pictures soon since my grandmother has asked to see them), I have popped enough popcorn to feed a small village or my family and the entire 7th grade (Jay requested it for the 7th grade holiday party), I have burned a quadruple batch of said popcorn, work has been done, writing has been done, pictures have taken forever to upload, some Christmas shopping has been done and (some) laundry has been washed (yes, it is still waiting to be folded). I decided to make meals easy since things were so crazy. I also like to have a little fun with it since stress can be high for the boys on crazy days. I introduced Jay to a "toad in the hole" this week. Max has been doing this for a while now, but Jay has just discovered his love of running eggs and toast. He thought this was a perfect way to enjoy it and I have to agree with him. 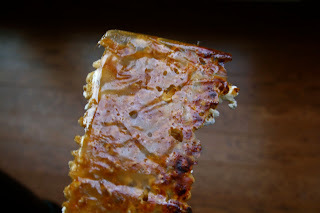 half of it was like brittle. 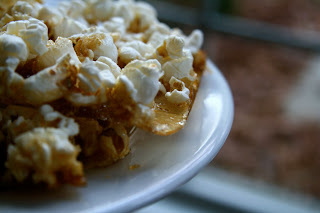 I accidentally made popcorn brittle! Don't ask me how or to repeat it, but look at that perfectly bruleed candy! I am glad it wasn't a total loss, but I was pretty mad when I realized it was burning. 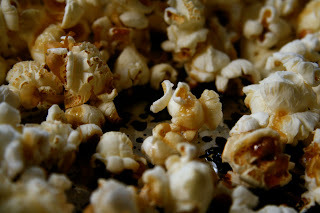 My guess is that since it was more sugar in the pot, it needed to cook a little longer so it would thicken and stick to the popcorn instead of run to the bottom of the pan. Oh well, it was fine in the end, but frustrating since I was on limited time last night. While I am confessing, I just burned some sweet potato fries in the microwave that I was trying to heat up from the other night. Tony has just told me that one more thing burns and I am banned from the kitchen. My guess is that will last until he is looking for sausage balls for movie night tomorrow with the boys! I am hoping to find some time to organize myself this weekend. What is every one else doing! And I agree this has been a crazy week for me too! I can't believe it is already Friday!! toad in the hole, used to make those as a kid! but the bruleed carmelized popcorn...you're right, not repeat-able, but so good the one time :) aside from no doubt the NASTY stench in your house. I burnt some toast today for Skylar and god, i hate the smell of char! Eggs in a basket. YUM! 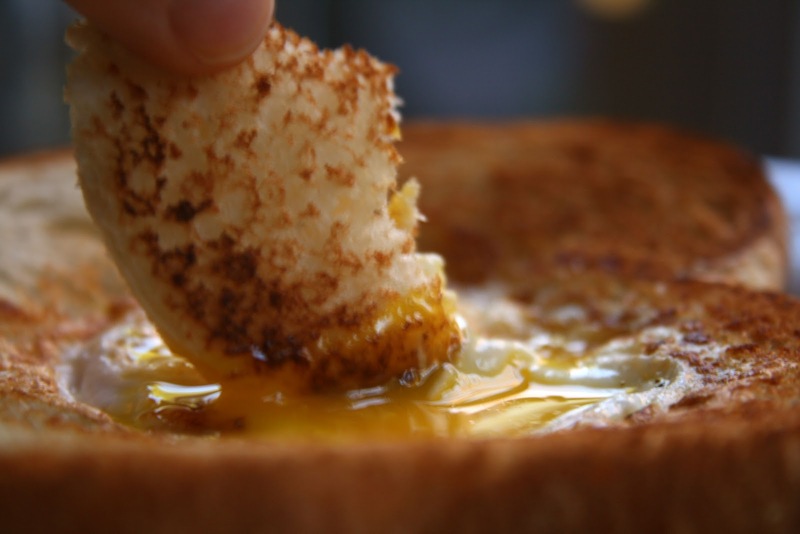 Try making it with french toast. On another level! Gourmet popcorn like that for an entire class seems like a pretty huge undertaking! Much more so than cupcakes or cookies... brave! Have a great weekend! I hope things slow down a little for you! I agree with you Sarena, this week flew by! I hope that you get some time this weekend to regroup! Your toad in the hole looks delicious. I've never had it! Jason loves those and calls them Toad in a Hole. I had never heard of them or had them. Sounds like it was just a bad kitchen day huh? I most definitely have those. I hear ya on a crazy week. I hope you get some down time this weekend! 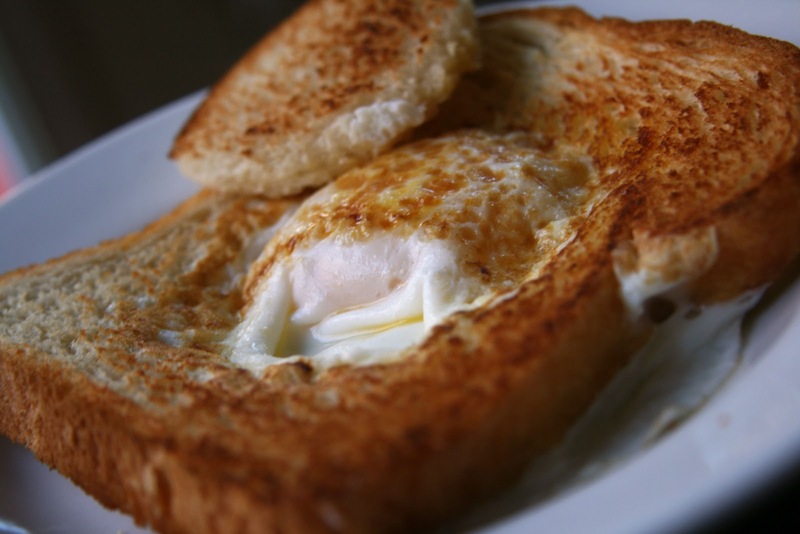 I've always known it as eggs in a basket - so good!! I need to make a toad in a hole! I love eggs and bread like that. Do you just cut out a hole in the bread and fry it? mm those toad in a holes look yum! !